Your daughter has been missing for 10 years, she’s standing at your door and hasn’t aged a day. 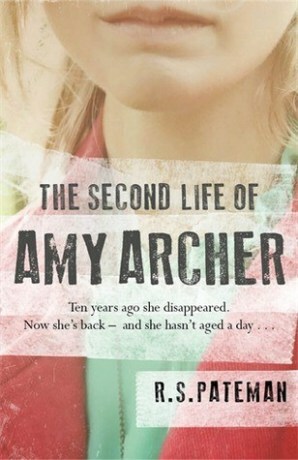 For the past 10 years Beth Archer has been struggling to cope with the disappearance of her daughter, Amy. Although slowly rebuilding her life Beth is reluctant to let go and makes annual visits to psychics, one of which tells her ‘the little girl…she’s coming soon’, although not as she expects. As a young woman, Jenny, stands at her door claiming that she knows Amy is alive and introduces her daughter Esme, who has a chilling resemblance to Amy and memories that no one else can understand, they claim she is Amy reincarnated. The novel really is full of twists and turns, although the concept of reincarnation is not one that I had come across in a novel before I absolutely loved it and it was a daring move to place the use of psychics within a crime novel. It’s hard to believe that this is Pateman’s debut novel. This novel is more than just a thriller it’s engaging, stimulating. As a reader I didn’t just get to know the characters I considered theories of reincarnation, afterlife as well as getting stuck into Beth’s mind as she confronts something that none of us could even imagine. The character of Beth has received some criticism but I personally thought she was a great character. She reminds me of real life mothers who I have seen portrayed in the media, blames for their children’s deaths or not being careful enough. She is distraught and desperate for some or any connection with her daughter, as I believe any mother would. The pain radiates through the pages as she struggles to deal with the ten year anniversary of Amy’s death as well as Esme’s claims and intimate knowledge of their family life prior to the kidnapping. Your thoughts mirror Beth’s, is any of this real? How could this ever work or is this all just a clever and devastating ruse to ruin her life. I have to admit that at times I found Beth’s character to be selfish and incredibly fragile but then I considered how anyone would react when faced with this situation. Even if you have to put the book down (which I wouldn’t recommend) it’s simple to fall seamlessly back into and read continuously for hours. I want to give this book 5 stars *****! I can’t even begin to describe how much this novel excited me, it’s so refreshing to find a novel that is not only full of original ideas but also taps into a complex set of characters. The only other thing is that I would have liked to have known a bit more about Libby, but this may have hindered the plot, so I think it’s for the best. I was also fortunate to talk to the author (who is also lovely!) and discuss the ending, which has received mixed opinions but in my opinion you’ll absolutely love it!